We garden fairies decided to do another guest post because once again Carol has left her laptop running while she’s off doing who knows what right now. If you see her, please let her know that the Labor Day weekend is the perfect time to finish mulching the flower beds and start pulling out non-producing plants in the vegetable garden. And oh yeah, she should not just mow the lawn this weekend, she should trim and mow. In the meantime, we garden fairies will be gathering up the tiny blooms of Caryopteris divaricata ‘Snow Fairy’ to use in our own Labor Day weekend celebration. When we say “tiny”, we mean tiny. You almost need a magnifying glass to look at the details, at least Carol does! Caryopteris is a member of the Lamiaceae family, also known as the Mint family. At one time it was in the Verbenaceae family but something must have happened, and it got moved to the Mint family. There are rumors on how this came about, but we garden fairies don't traffic in rumors, so we'll just accept the move and move on ourselves. 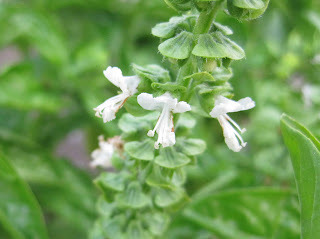 Yes, we know that when we mention the Mint family, everyone immediately starts thinking about how mint likes to spread and spread and spread until it takes over a flower bed, and then it looks to see where else it can go grow in the garden. But there are many other useful plants in the Mint family that are well-behaved, like the Caryopteris. 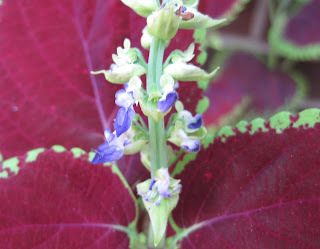 The Coleus is a well-behaved member of the Mint family and up close its blooms look similar to that of a Caryopteris. Recently the taxonomists changed the name of Coleus to Solenostemon scutellarioides. We garden fairies have no idea how to pronounce that so we are going to stick with Coleus, thank you very much! Did you know that most members of the Mint family have square stems? Sure, everyone knows that. 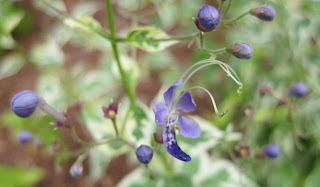 But did you know how pretty the flowers are, especially when viewed up close, like these basil flowers? 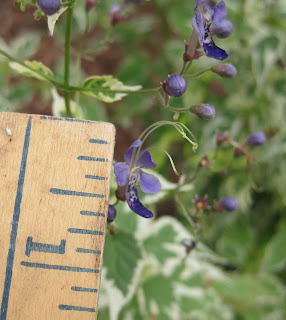 We garden fairies don’t mind the tiny size of the blooms of these members of the Mint family; we actually prefer them. But we do wonder what people would think if the blooms were a lot bigger. Carol has some history with the Mint family, going back to when she was in high school and planted some spearmint in her parents’ backyard. Funny thing, we hear reports back from the garden fairies there that her spearmint is still growing where she planted it and in several other locations, too. And that's after ten, twenty, well, a lot of years. 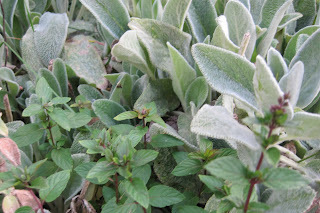 But she never really learns, never thinks she can’t control a plant, so now she has chocolate mint planted near some Lamb’s Ear, Stachys byzantina, which is also in the Mint family. She let’s those two plants fight it out, so to speak. Even after they battle for space, we guarantee that she pulls out a lot of that chocolate mint every year, and she cuts off the flower stalks on the Lamb’s Ear nearly as soon as they form to keep them from getting all floppy. We garden fairies don’t mind, though, as those soft leaves of Lamb’s Ear make for a great place to sleep in the middle of the day, and when she removes the flower stalks it keeps those noisy buzzing bees from coming around and disturbing our sleep. And that chocolate mint is as close as we garden fairies will get to chocolate. At one time there was another member of the Mint family, Monarda, or bee balm if you prefer, self-sowing and growing throughout her garden, but Carol managed to get rid of those seedlings and switched to a dwarf Monarda that is much better behaved. But clearly, based on the number of pictures she took of it, her favorite plant in the Mint family is currently Caryopteris divaricata ‘Snow Fairy’. Dear THorn, it was delightful to see you emerge from the garden. I imagine you are busy getting ready for fall. Those lambs ears are so inviting with their soft texture. I am sure that soft gray color looks appealing with the blue careyopteris nearby. Watch out for that chocolate mint. It will send runners around the flower bed. You will find it everywhere just like garden fairies. Mint flowers are definitely fairy flowers, Thorn! I'm glad you and Carol took the time to collaborate on showing us these "slow down and look" flowers. 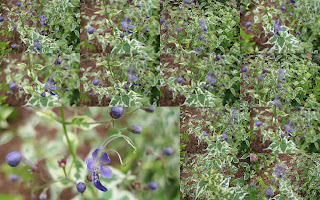 Great post, Thorn - I wasn't aware that Caryopteris was a mint. I just got one this year, and I hope it will make it through the winter. Poor Carol isn't alone in making the spearmint mistake. My mom did the same thing. It took quite a few years, but she & I eventually got it all out of her garden. I didn't realize coleus (or whatever its new name is) was a member of the mint family. But now looking closely at its flowers, I can see the family resemblance! Fun post on mint. Yes, indeed, spearmint and peppermint are take-over plants. Thorn, thank you for a fun post today. I had no idea I had so many mint plants out there in my garden areas. Now to plant more. Bring in the noisy bees and the nice fairies. Thorn, I'm so glad Carol left her laptop on! I always enjoy reading what you have to share with us, especially all the little tidbits about Carol that she'd rather we not know, like planting spearmint in her parents' garden:) I had no idea either that coleus was in the mint family. Obviously, it's a well-behaved member of the family; although I have it growing in many of my containers as well as in the shade garden, it doesn't crowd out the neighbors. I should listen to the fairies at Toad Haven, they could have explained to me why the Lambs Ears are attempting to take over the place. It is nice to have something that thrives in this hot, dry climate.